I just received my first holiday e-card via email from a business. It made me think of the different ways I can stay in touch with clients and prospects this year within social media sites I am on. The benefit provided with this ecard from SCS | BT Squared - Engineers and Environmental Consultants was the clever list of what to do with it afterwards. According to the email, I have ten ways to reuse those paper cards. 10. Create gift bags or tags for gifts. 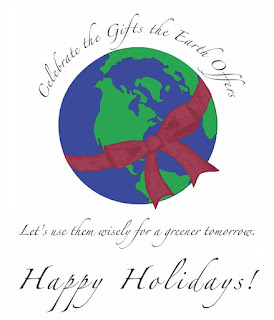 You will recycle the greeting card, as well as a bag! 9. Make an origami creation. 8. Cut the backs off and use them as postcards or recipe cards. 7. Design ornaments or coasters by using CDs with pictures from an old greeting card. 6. Send your cards to St. Jude’s Ranch. 5. Shred and use for colorful hamster bedding, so your pet can have a festive cage too. 4. Make confetti for your New Year’s Eve celebration. 3. Use the blank space to perform storm water calculations or to doodle. 1. Recycle cards to create new cards. The front of a card can be used to decorate plain cards. I liked the list and I have decided that I like e-cards sent as a html card. I have nothing to throw away, but I still know that I am on "The List." What I don't like are the e-cards that may come with suspicious links from some of the services since spammers and others use this technique to scam. I haven't sent out my own mailed holiday cards in a long time. I just can't get it on my schedule. Neither for myself personally or business. I have been searching for a better occasion or touchpoints at different times of the year, not just the holidays. As our contact lists grow, our networks expand with various social channels and our social ecosystems become a swirl of activity with global reach, just how does one keep track? This is where social media tools come in pretty handy. 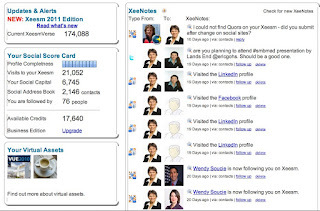 I use XeeMe.com (Disclosure: I like it so much I am an active business partner) to build groups and list of people I want to stay in touch with. It tracks when and where I last made contact with them. Better than the annual holiday card list for sure. I have recently participated in networking activities surrounding use of this tool and can actively track that using the tool while networking and connecting with people in my ecosystem has a 4 fold growth in activity of new people inviting me to connect. Pretty good numbers I would say. Finding strategic tools that make me more efficient is a goal of all business users in social media channels. We have a ROI problem. That is, we are constantly documenting what we are doing, the results, and the revenue that can be attributed to the activity. On the Business Development side, Xeeme lets me follow the person I am interested in across the sites that they are active on. It also makes me much more approachable for others to connect with me. Connections good. Hard to connect bad. As we move into 2012. Trust, approachability, quality network growth, social business activities and social capital will be the focus for business use of social media. If you are looking for a competitive advantage you should consider social tools that allow you to be focused on the person you want to build the relationship with and a way to track the social capital you are building that translate to trust in the market place. As a product of public education, as well as my husband and three children, there are visual reminders of the the challenges public education faces due to budget cuts. Where will learners go without access to a free education at the primary and secondary school levels. My family would not have had the money to send me to a private school. There would be one less engineer and entrepreneur today if I had not had access to a public school education. 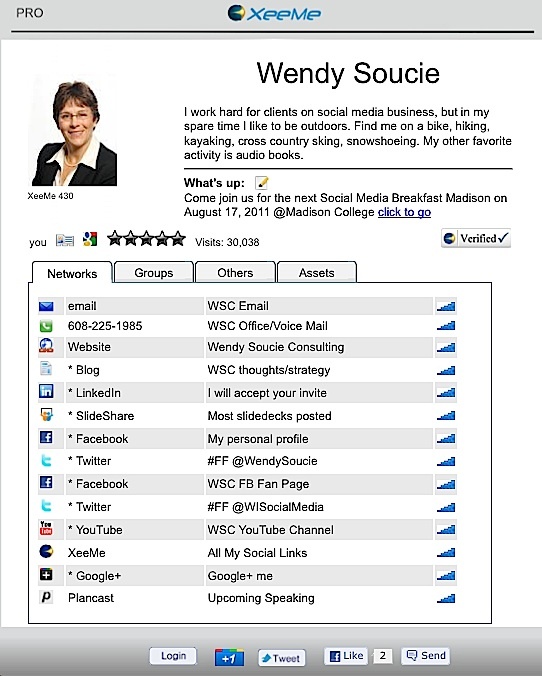 In preparation for the upcoming Social Media Breakfast Madison with a Panelist program on Social Media in Healthcare, I thought I would see what the story was in the social ecosystem. No better tool than Storify.com to quickly get a sense of the action. I am an avid bicyclist. I wouldn't call myself rabid. I have bike commuted to Madison before, and try to ride to my office in Lodi from my house one or two days each week, but I am not consistent. I wish I had a position that would allow me to do that since I would be a lot happier overall. I am also very committed to my local community in the Scenic Lodi Valley, the Town of West Point in which I live and Columbia County. There is a passionate group of individuals in the Columbia County who are working hard to make biking and other outdoor activities like hiking, kayaking, canoeing, camping and walking part of every trip into this broad community. To that end, I have been working on a bike route mapping project that I hope will be successful in ensuring that the US Bicycle Route 30 comes into Columbia County via the Merrimac Ferry and through Lodi on its way to hook up with the Bike Path on Hwy 12 and onto Madison. I made my project also something of a work-related project. As a certified social media strategist, I wanted to use this as a case study on how one person could make a difference with a thorough strategy, action plan and a few social media tools. This is an ongoing project and we have accomplished much this year. If you do some searches for Columbia County Biking, you can judge for yourself how we are appearing in search results under blogs, images and video. I have included my presentation given at the WI Counties Association Annual meeting where I presented. 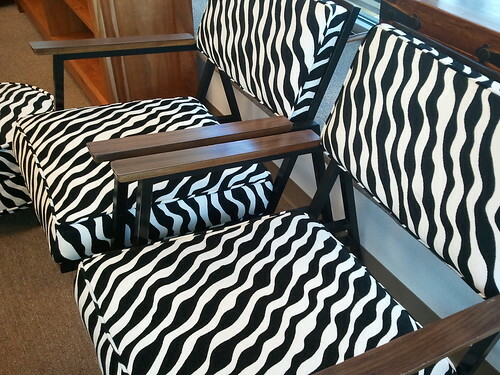 Striped chairs- on the wildside, a photo by wendysoucie on Flickr. Wendy's Note: Just a little disappointed that this guide total makes LinkedIn a boring choice. Its certainly can be a safe choice. Wendy's Note: As an avid hiker and outdoor person, Lyme Disease is always on my mind. Recently I was in my home state of New Hampshire which is consider Lyme Disease Central and pulled off 12 ticks in a short walk in the woods, 8 of them being deer tickes. While I don't have Lyme disease, I have read this passionate plea for help and wish to share it with my broader community in case you have personal experience that could be helped by Trish Braden's story, or if you want to support Dr. Hoffman. I know others who have suffered, but perhaps caught the disease early. At 23 years old, Trish is too young to have this kind of experience in life for sure, and at the hands of what we consider the better hospitals in the area. Personally, I had a misdiagnosis of Hyperthyroid for almost a year so can understand the struggle that Trish has faced with her medical treatment. Hope this helps others. Please share Trish's link to her blog. When talk of Halloween began in early October, it got us thinking. Horror movies and strange noises in the dark definitely put one on edge this time of year, but what’s really scary for pros in our industry? What do social media professionals think is most frightening? The infographic below shows what they told us in a survey conducted this month. 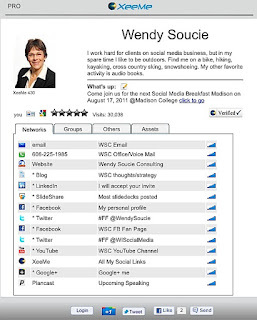 Note from Wendy(all my social presences at Xeeme.com/wendysoucie) : Infographics are one of my favorite types of sharing. What are some of the best you have found? UW Fall, a group on Flickr. This is a group crowdsource project by the communication and social media professionals at the various UW Campus locations. They created a group, tagged photos with UWFall and then pulled them into the group for sharing. Great idea to spread UW Love. 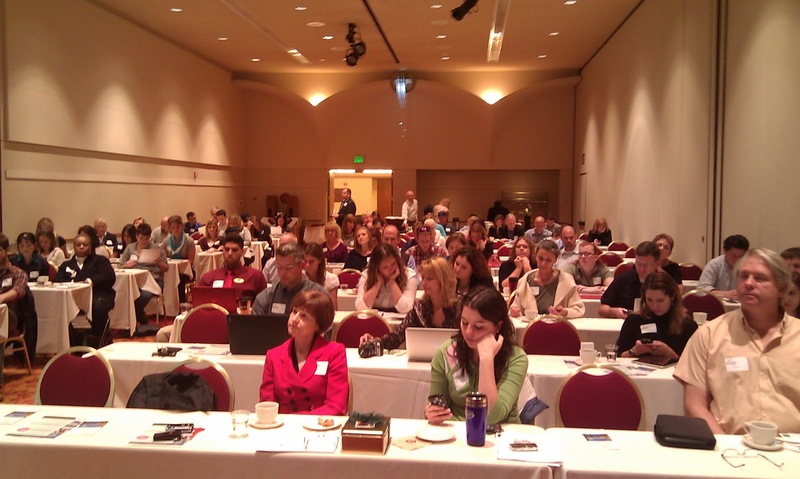 This is the Twitter back channel from the September 21 SMB Madison event. 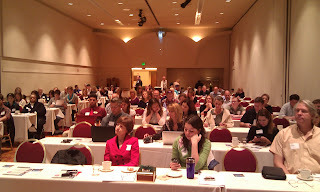 Speakers were Rich Hankison and Alison Dodge - official team from Google Places Madison. Katy Morgan Davies not in the house today. The presentation focused on benefits, analytics, advanced best practices and a busy Q&A period. Packed room with 125 people anxious to learn and network. 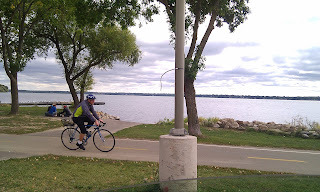 You couldn't ask for a venue with a better view than Monona Terrace and so much parking space. I hope we get more sponsors so we can hold there again. We were supported by financial contribution or inkind support by @GooglePlaces, @Crema_cafe - Steven Buchholz owner, @Wisconsinmade - owner Linda Remesachatis /Amanda Maurer, @mononaterrace Fran Puleo, @suttlestraus, Kari Schneider. 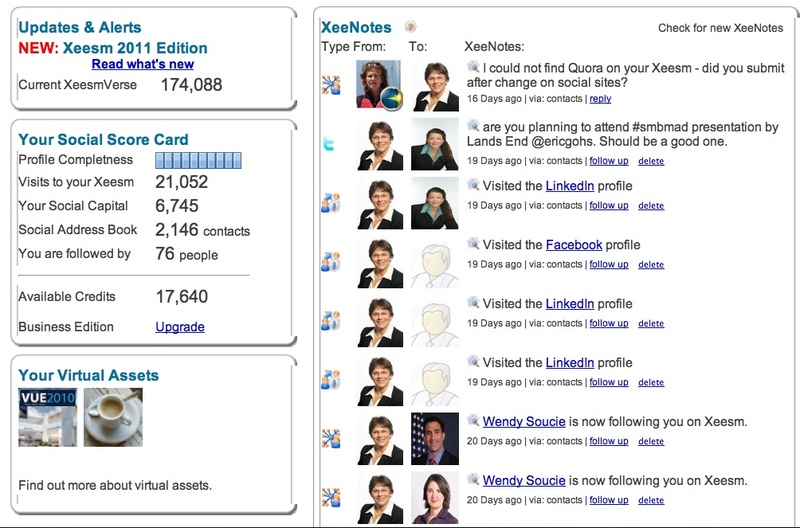 Blog verification process for Empire Avenue - Interesting social capital experiment. 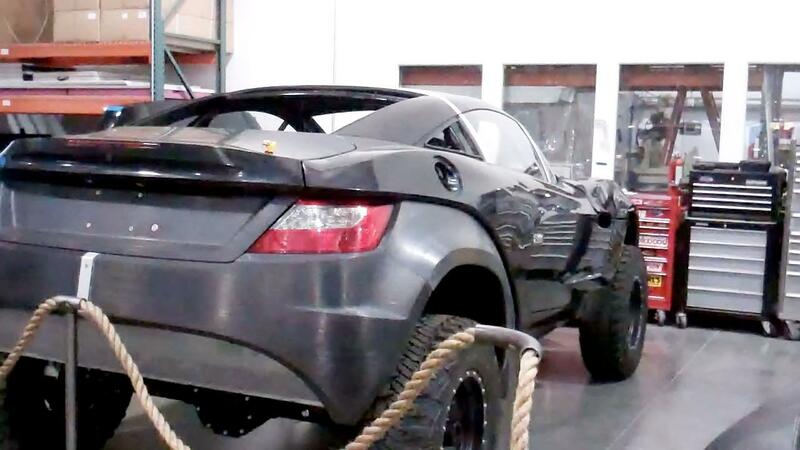 This article about Local Motors is pretty interesting. Jay Rogers, CEO of Local Motors got to meet with President Obama just before a conference I attended in Phoenix on CoCreation and Social Product Development. The point is that a flexible small microfactory made this military vehicle. Ultimately, Local Motors plans to have many small micro factories located in many urban areas to serve the needs and wants of customers and vehicle requirement in that geography. Case in point, while a dirt and sand optimized vehicle was designed for Arizona, the Boston vehicle design included electric and urban city driving features. One for our area in Wisconsin might include diesel fuel options as well. Keep and eye on Local-Motors.com and consider joining their community if you want to contribute to the thought leadership! More Non Profits are evaluating social media as an additional channel that they can use for reaching out to donors, sponsors, volunteers, and clients. Make sure it aligns with your organizations goals, verify that your audience is using the social space, build a strategy that takes into account your resources - time, budget and staff skill set. This is the time of year for local races that support good causes. Lodi's 22nd Annual Library Run is one of those. With over $30,000 raised in the past, the Lodi Community truly benefits. 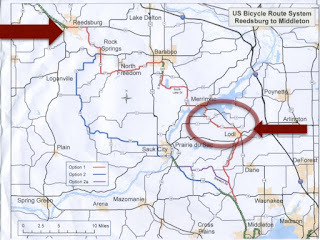 As part of a project with the Columbia County Bike Paths Committee, I am writing about various bike rides in and around the Lodi, West Point, Dane, Arlington, Poynette, Portage, Rio and Pardeville areas. Pretty much a 50 mile radius around where I live. 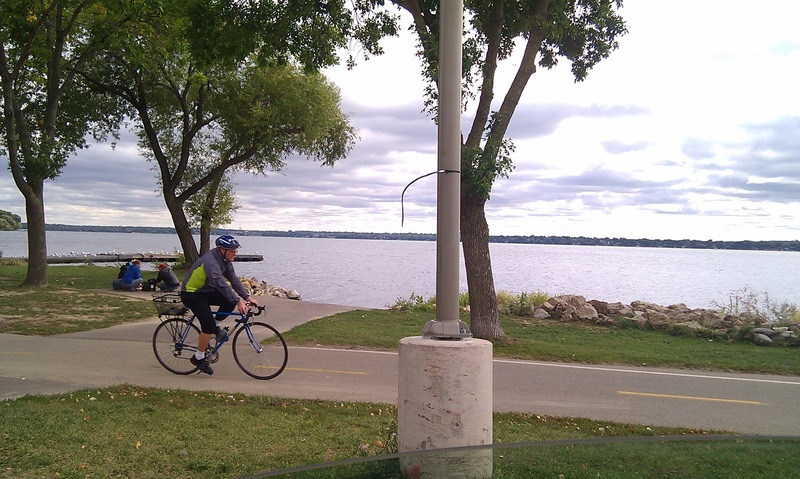 The reasons to do this is to begin a very visible campaign of bike rides that people and take in our area and that would also connect with United States Bike Routes (USBR) State 30 in Wisconsin. Columbia County is determined that this route will go through the Merrimac Ferry to Lodi on its way across the state. You can help by Retweeting the article, bookmarking it, sharing it with your friends on Facebook and LinkedIn. More importantly come try the bike rides. There are some of the most scenic that Southern Wisconsin has to offer without a long drive. One great thing I can do to help my local town events, is to balance my knowledge and skill with social media to help them get broader exposure than traditional marketing budgets and time allows. Barbara, this post really hit home for me because I am getting slammed with LinkedIn Sales SPAM. Here was the latest - someone sent me a invite with a custom message (seemed fair enough and it was with a company I might want to learn more about), which I accepted with a reply message that I look forward to see his activity on LI. The next day I got an email SPAM sales letter that I ignored since I didn't ask for any of the materials or have the time. The following day I got a phone call from a middle east country with a sales pitch. This is happening more frequently since the "sales" teams are getting shut down on email. I hate to see LinkedIn get abused this way. I am going to start build a wall of shame for these sales SPAM emails so I can generate an example post like this! Thanks for reminding everyone on the sales side not to "be that guy." If you’ve ever read a blog post of mine, heard me speak or follow some of my musings on LinkedIn and Twitter, you know that I really hate it when I receive sales spam in my email and/or LinkedIn inbox from people that I do not know. Whether it is a cold call or a cold email, it is still cold. The effective use of technology presents huge opportunities for the savvy salespeople who get it. These rock stars know that using social media gives them an avenue for building relationships and demonstrating expert credibility BEFORE sales opportunities present themselves. There are however, too many salespeople using technology as a way to send the same boring, boilerplate sales spam to anyone with an email address. Ellie was a real trooper and helped with signage, tweeting ahead, twitpic taking, keeping me awake, and on time to the next stop. She gets the point in getting our social stream going for this event - We want Ford to come to Madison and talk social media. Not just anyone, Scott Monty. There is always an opportunity to volunteer with the Ice Age Trail. 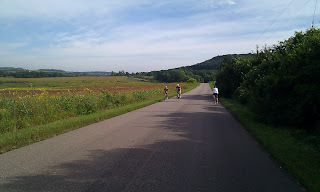 You can meet new people, get some exercise and contribute to Wisconsin's national treasure - our Ice Age Trail. What not to do on social media. Do people really not think? I have been interviewed on this subject by Carleen Wild on NBC15 in Madison WI. 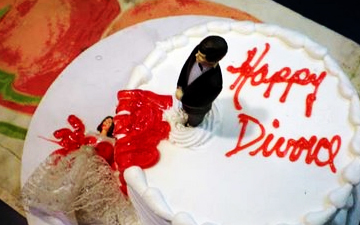 Facebook is being dragged into more divorce cases each day as evidence of betrayal, infidelity, and just plain nastiness. I always tell people when I speak to groups, if you want something private, do not put it on the Internet in any way. We know Facebook gets brought up in a lot of divorce cases, but this is ridiculous. A 29-year-old woman going through a difficult divorce created a fake profile in an attempt to get some dirt on her soon-to-be-ex-husband. Posing as a 17-year-old girl named Jessica Studebaker, Angela Voelkert contacted her husband, David, 38, on Facebook. The friendship that developed between the husband and the fake profile turned out to be a lot more incriminating than Angela could have imagined at the outset. In messages with “Jessica,” David predictably asked the girl to run away with him; he also admitted that he had installed a GPS tracking system on his wife’s vehicle — both of which are enough for criminal charges in themselves. I ran across this humorous look at digital death by Chris Faraone of The Boston Phoenix. I have been considering using a service to manage my web portfolio and digital online reputation management. I know my Internet adverse husband would be totally lost should I need someone to do something in my untimely demise. I would go with my home town guys as well - Entrustet. In the absence of meaningful state or federal regulation regarding post-mortem rights in cyberspace, a so-called digital death industry is booming. Sites like DataInherit, a "Swiss bank for data" — have tens of thousands of users in more than 100 countries. MemoryOf, which allows survivors to build tribute pages, is steadily approaching the 100,000-memorial mark, while the comparable 1000Memories recently became the first company of its kind to attract a seven-figure capital injection. There's been some notable coverage of digital death; business publications are especially enthralled by the potential of this relatively uninhabited marketplace. But I chose a more practical approach to probe the phenomenon, and decided to write out my own Web will. To that end, of the dozen or so services I could have used for digital asset management, I picked the Madison, Wisconsin–based Entrustet, which has emerged as an industry leader. The three-year-old company's co-founder, Newton native Jesse Davis, is a young healthy dude who I think will be around for a while, and who says his company has taken serious safety precautions, going "above and beyond" standard security measures to deeply encrypt information. ﻿﻿I am always looking for new technologies to help small groups and organizations be more social and share the experience of being a member or attending an event. Smilebox.com provides a simple way to build a slideshow with music and text. It was very easy. What it doesn't have is an upload to Youtube which would make it that more shareable. For that I prefer Animoto.com since they make that part easy.